In 2007, I spent some of the summer in Israel and stayed at my home in the village of Bnei Zion. Our backyard lawn was green and inviting, and I was full of energy. I decided it was the right place for sharing my obsession with genealogy with my extended family. 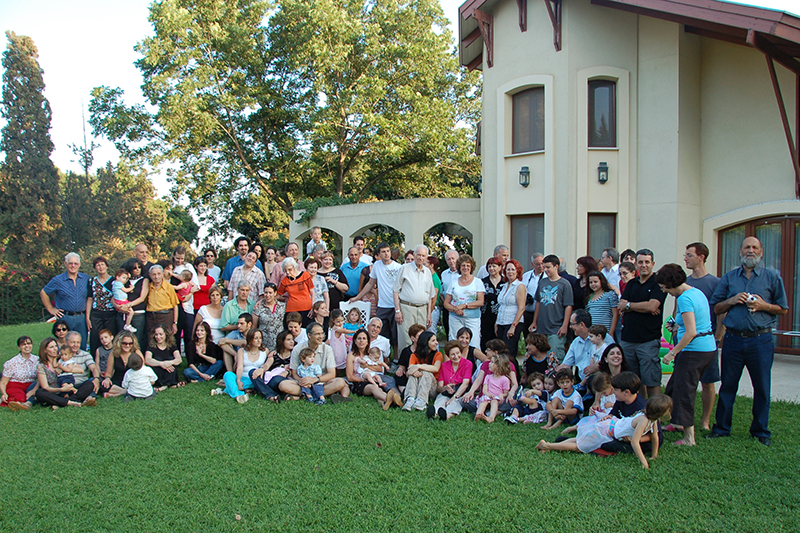 On one Saturday bright afternoon I invited all my Sznajderman relatives to our garden. Sznajderman family gatherings are always fun. ‘Sznajderman’ is almost synonymous with the words ‘pleasant’ or ‘being nice’. Family members came over from all over the country for this special reunion. Among the guests there was a newborn - a one-week-old baby - and 95-year-old uncles. There was plenty of food. 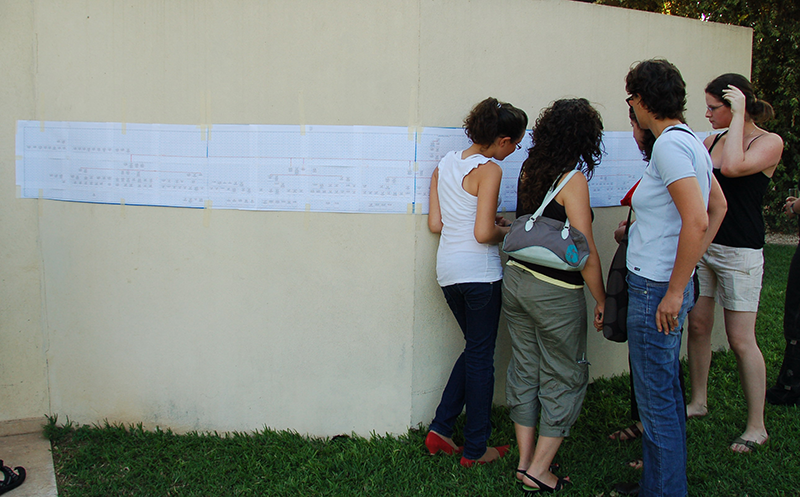 There was a family tree diagram pasted on the wall, complete with pencils alongside for viewers to add and correct the data. And of course there was a lot of squeezing and maneuvering to get all of us into one clear photo. It was an enjoyable afternoon for everyone. My grandmother was Chana Kaluzynski nee Sznajderman. Her father, Eliezer Sznajderma and his siblings, and her eldest brother, Abraham Moshe, were all born in the town of Pilica. 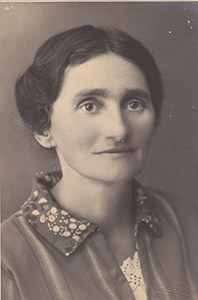 My grandmother, along with six of her eight siblings, Wolf, Sima, Shlomo, Dawid, Ryfka and Israel were born in Zawiercie, Poland between 1879 and 1890. Zawiercie and Pilica are 10 miles apart as you will see in the map. Unfortunately, when I visited Poland with my husband and my sister Ora in 2002, I was only beginning to research my family roots. I had never heard of Pilica and had no knowledge of our family ties to the town; as a result, we didn’t stop there. It was only later when I had delved deeper into research and collected more records from Polish archives that I traced the origins of the Sznajderman family back to Pilica. 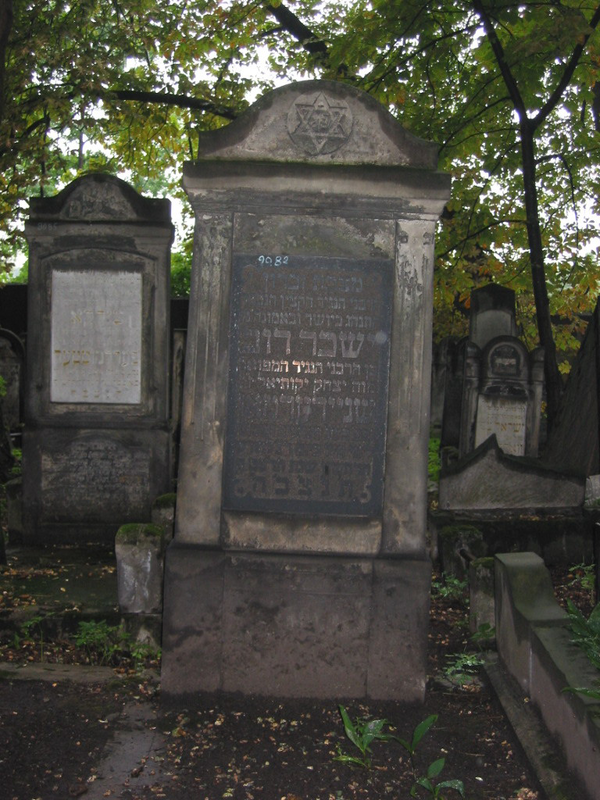 Several members of the Sznajderman family were laid to rest in the cemetery at Zawiercie: My grandmother’s parents, Eliezer Sznajderman and Eygda Sznajderman, her eldest brother, Abraham Moshe Sznajderman, her uncle, Isachar Dov Sznajderman, and the wife, Rachel Bayla, of her uncle Mordka Leyb Sznajderman. Eygda Sznajderman, daughter of Mordechai Aharon, wife of Eliezer Sznajderman, died in 1913. 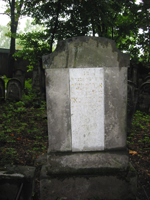 Our Sznajderman ancestors can be traced back to the 18th century in Pilica, Poland. I have identified Marek Sznajderman who was living in Pilica by 1819 and possibly even before that. Marek Sznajderman was born about 1778. His birth and marriage places are still elusive as of now. He died in Pilica at the age of 75 on the 28 August 1853. The earliest existing birth, marriage and death records (BMD records) for Pilica’s Jewish population are from 1808, and there is no record there for Marek’s birth or marriage. I searched the 1792 census for Pilica, but couldn’t find either his name or his wife, Rochla, in the list. I have purchased a book about Jewish Cemetery in Pilica. The book was published in 1995. It includes an introduction and photographs of every tombstone in the cemetery at the time of the publishing of the book. 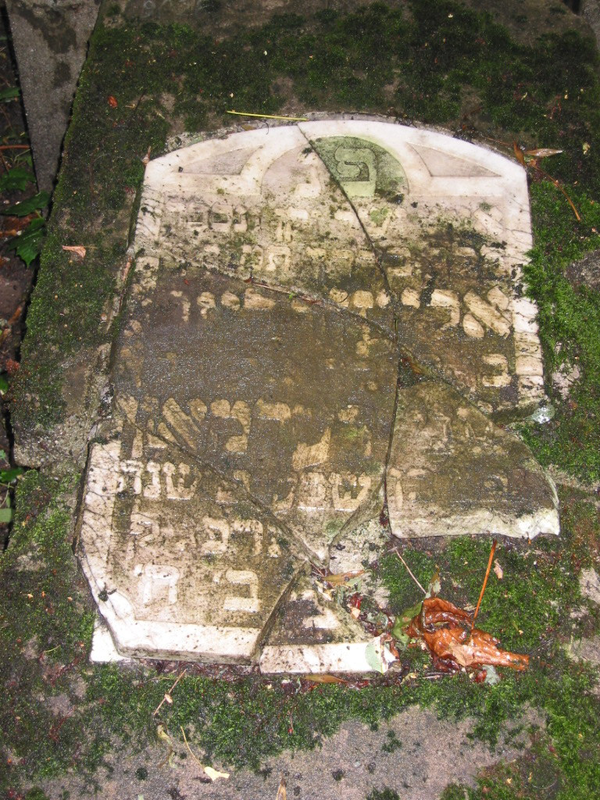 An organization known as CRARG has digitized the list of burial tombstones in the cemetery. I didn’t find relatives in the cemetery. A page with the translation of the historical part of the introduction will be added later to this document. The Pilica BMD records, however, did provide enough information to create a Sznajderman family tree with Marek and his wife Rochla at the top with several branches of their descendants starting in Pilica and moving on to other towns. We in Israel had never been aware of the existence of these other branches. All we knew is that our Sznajderman family descends from Eliezer Sznajderman, from Zawiercie. We didn’t know that Eliezer Sznajderman was the son of Icyk Zelig Sznajderman, who was the son of Marek Sznajderman, both born in Pilica. Both had many siblings, all are our relatives! Marek Sznajderman and his wife Rochla had their first daughter, Wita, in a town unknown to me, but their other three children, Icek Zelig, Hindla and Abram were born in Pilica. Most of the Sznajderman’s descendants left Pilica about hundred years after Marek Sznajderman and his wife Rochla came to the town. 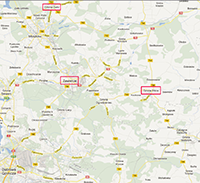 They left around 1880 and went to Zarki, Zawiercie, Sosnowicz, Bedzin and other towns. Collecting stories and memories about a Jewish community erased in the Holocaust is a problematic process that becomes more difficult as the years pass. The handful of survivors are getting older and disappearing from our lives. Unfortunately, the Holocaust survivors of Pilica and those who left before the War, unlike those in many other towns in Eastern Europe, didn’t join together to publish a memorial book. Sometimes the thought flits through my mind: “Should I initiate a last-minute Yizkor Book for Pilica?” As a leader of Pilica records translations I know several people who are interested in Pilica. Maybe I can ask them to sit down and write some facts, few memories. Then we can publish a Pilica Yizkor Book. Until now, however, I haven’t found the energy and time to initiate this project. In my search for articles and books about the history of Pilica and its Jewish community, I found some interesting facts that fascinated me as history per se. These facts also provided explanations for why many families left Pilica at the end of the 19th century. The following is my attempt to weave together some historic facts about Pilica prior to WWI with the few facts I know about the life of my grandmother’s eldest brother, Abraham Moshe Sznajderman. The town Pilica was known to have existed in the district of Krakow in the years 1115-1118. It received a right of township in the fourteenth century (1373-1394). Jews appear in Pilica around 1581. Until 1690 the Jews weren’t welcomed in Pilica, they were forbidden to live in the town and their synagogue was converted to a church. Jews returned to Pilica after 1690 when Michał Warszycki, the contemporary owner of the town, let them settle again in the town. They had a permission to have a synagogue, a cheder and a bathhouse. In the eighteenth century, the meetings of the Council of Four Lands, "V'ad Arba Aratsot", were held in Pshevarsk, Yaraslav, Ritsheval, Konstantinov, and Brody. The last meeting took place in Pilica. The council was the Jewish high institute of Poland from 1580 to 1764, which was responsible for collecting the Jewish taxes for the Polish government and led the Jewish courts. At first people attended the conference once a year, later twice a year: summer in Yaroslav, and winter in Lublin. The council represented the Polish Jews before the Polish government and her King, and the Beis-Din in Lublin was the arbitrator or final judge for law as well as for general customs. The council imposed the "great excommunication" in 1676 of Shabbatai-Tsvi and his sect, and in 1751 it was busy with the conflict between the Rabbanim Yaakov Amdan and Yehonasan Eibshitz. It also declared actions against Hasidism. The last meeting of the council took place in Pilica on the 4th of October, 1764. The Polish Parliament decided that "being convinced that the matter of Jewish representatives is not being conducted in an orderly fashion", choose to abrogate the council. The towns Pilica, Olkusz and Wolbrom worked hand in hand in their common battle against the dominance of Krakow's high-community. In Pilica there lived Teodor Vaslov, the finance- minister of Poland, Polish ministers and consuls, as well as foreign diplomats [that] used to come to see him. 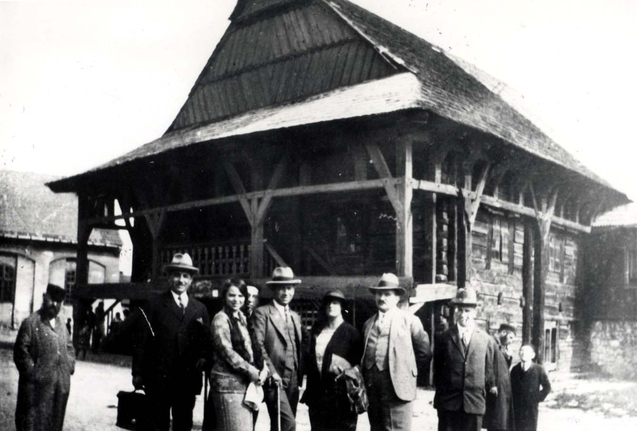 Further, Polish-Jewish managers used to gather in Pilica and conduct business with the finance minister, regarding tax/tribute and matters of finance. When I read the last paragraph and compare it with the facts in Sznajderman family tree I cannot but conclude that the Sznajderman families were among those who were affected either by the fire or the deteriorating economic situation and forced to move to Zawiercie. Abraham Moshe Sznajderman was my grandmother’s eldest brother and the only one among her siblings to be born in Pilica. His mother, Eygda Sznajderman nee Sztatler, named him after her grandfather Abraham Sztatler who died on 3 November 1865 in Olkusz, Poland. Abram Moshe Sznajderman had seven brothers and sisters: Wolf died when he was one month old. 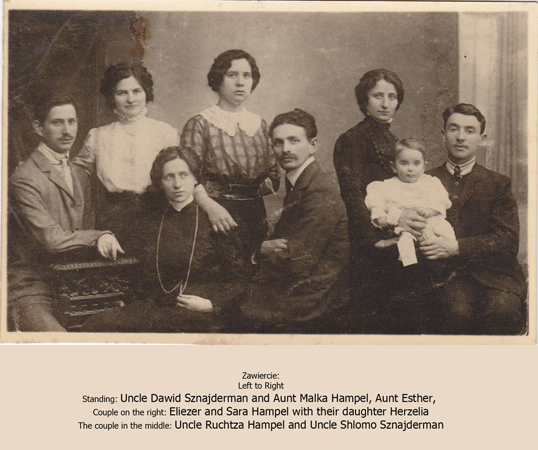 Chana, Dawid and Szlomo immigrated to Israel at about 1906, and lived, raised children and died in Israel. Their life story is the story of the foundation of Israel and will be told in separate pages. Another sister, Ryfka Sznajderman, immigrated to Israel at a later date, with her son Chanan Paisak. The brother, Israel, joined his Zionist siblings around 1910, but returned back to Poland and spent WWII in hiding in Holland. Yet, another sister, Sima, married Icyk Borenblat from Kielce, in 1897 when she was nineteen years old. Her marriage record is the only fact the archival records show about her. 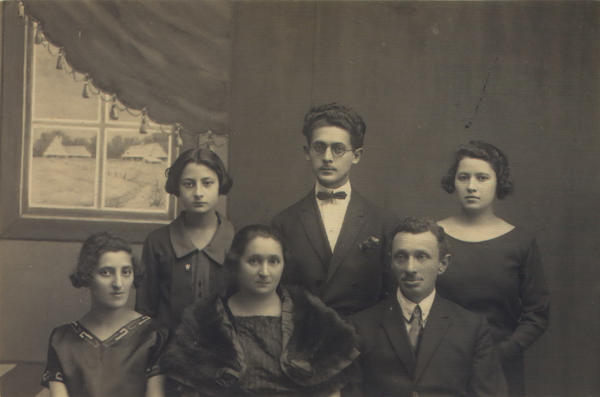 Sima and her husband don’t appear in the 1906 family photo of Eliezer and Eigda Sznajderman in Zawiercie and didn’t leave us any other photograph or document. A request I sent to the ITS didn’t reveal any details about the fate of Sima and Icyk Borenblat. They seem to have disappeared from the family horizons even before WWI. 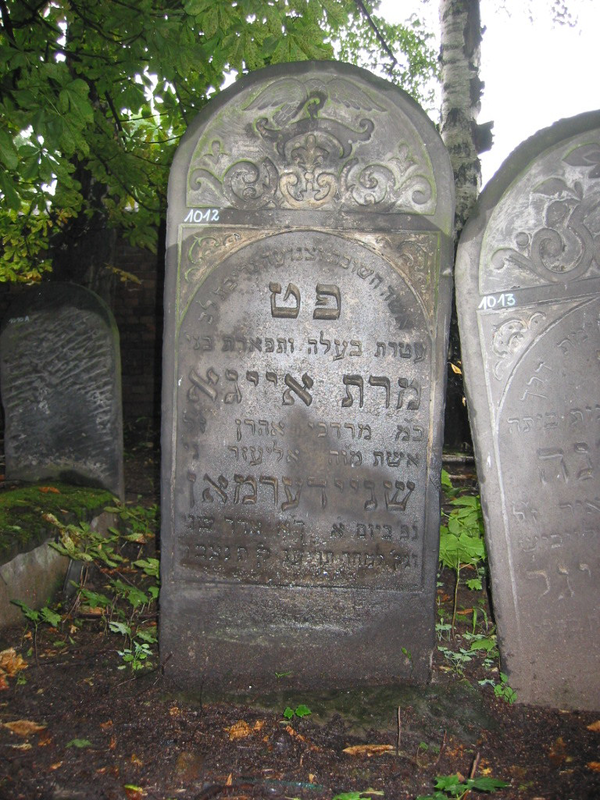 Abraham Moshe didn’t join his siblings’ quest to explore life outside Poland, but stayed in Poland and wandered from one shtetl to another until his death in 1938 in Zawiercie. The wanderer Jew. 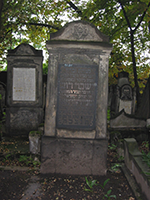 Abram Moszek Sznajderman married Adela Koeningsberg on 26 Feb 1897 in Zarki, Poland. The family of Ajdla Konigsberg family can be traced back to the 18th century in the town of Zarki. Zarki is 9 miles SSE of Zawiercie and 16 miles SE of Pilica. Abraham Moshe and his wife Ajdla had two sons and three or two daughters. 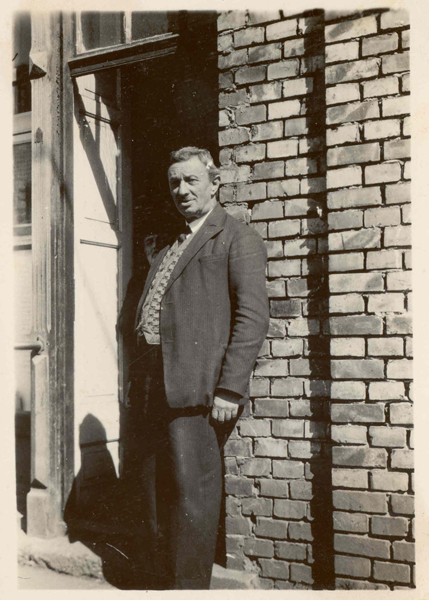 Their first son, Dawid, was born in Zarki on 23, October, 1897. Ajdla’s grandfather was Dawid Koeningsberg. He was born in Zarki around 1820 and passed away in 1874. Ajdla probably named her first son after her grandfather. The young couple moved from Zarki to Zawiercie to join Abraham Moshe parents and siblings. 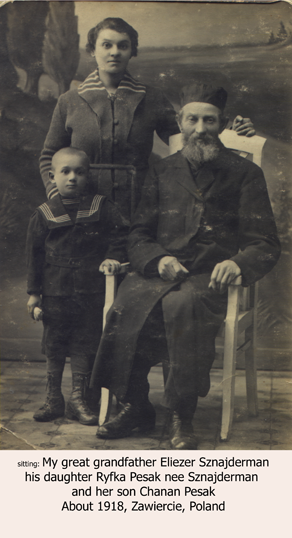 In Zawiercie they had their second son Mordka Sznajderman on Jan 11, 1904 . Abraham Moshe’s grandfather on his mother side was Mordechai Aharon Sztatler. He was born in 1814 in Olkusz and died in 1894 in Zarki. Abraham Moshe named his second son after his grandfather. Mordka Sznajderman Birth place has to be verified with a full birth record from Zawiercie USC office. As of Sep 24, 2012 I have already requested the record. At the beginning of 1900, Abraham Moshe and Ajdla moved to Pilica and had two girls: Idessa and Gitla. Both girls, according to the index of birth records, were born in 1905, and we may assume they were twins, although no one in the family ever mentioned it specifically. Full birth records of the sisters may provide certain proof one way or another. There is one hint to the strength of their bond: both Idessa and Gitla moved to Israel together. Idessa, or Judith, as we know her, was married in Israel to Moshe Perla and immigrated to Mexico. Gitla, or Guta, returned to Poland. Her fate is unknown. 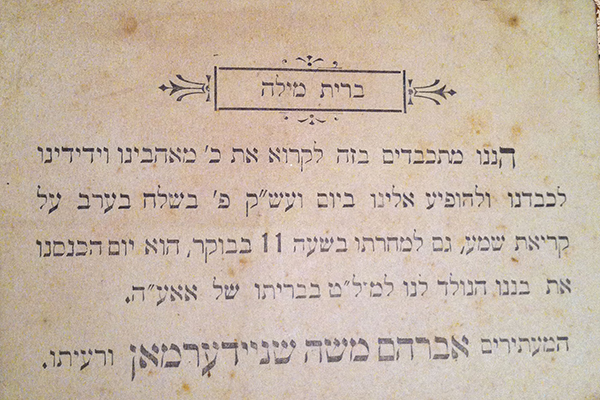 Translation of Birth Records for Idessa and Gitla Sznajderman from the town Pilica. Idessa was named after her father’s grandmother Idessa Fajner, and Gitla was named after her mother’s grandmother Gitla Schif. 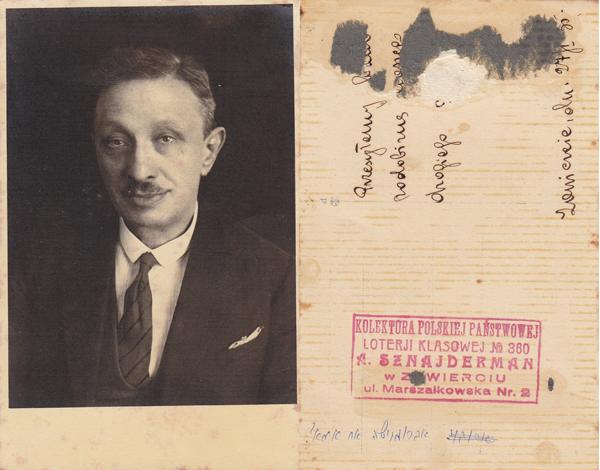 A photo of Abraham Moshe shows a permit to sell lottery tickets on Maszalkowska Street Number 2. As a side note, one of the shops on Marszalkowska 9 today, 2012, is a shop displaying the name "Tribal Tattoo and Piercing ." Robert Fauszowicz provided the photo. Dawid Sznajderman, Abraham Moshe’s eldest son, studied for five years in the technical high school in Warsaw starting in 1915. Warsaw was occupied by the Germans from the 4th of August 1915 until 1918. The Germans allowed the school to continue its instructions in the Polish language. The assets can be located by following the instructions at the site and proving the relationship of the person who makes the request to Abraham Moshe Sznajderman. The list is about a community tax, a fee which the wealthier Jews paid to the community. The community tax was not a large sum since its uses were not too large. One needn’t to be really rich in order to be asked for the fee. 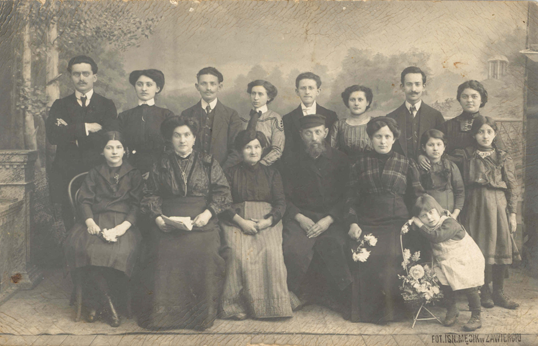 In the family photo above, sitting in the center are Abraham Moshe and his wife, Ajdla Keoningsberg. Dawid Sznajderman, their eldest son, is standing behind them. Mordka the youngest son is absent in the photo. Maybe the photo was taken when Mordka or Maurice, had already left for Austria. Dawid and Mordka stories will appear in separate chapters. On the left, there are two girls. One is sitting and her sister standing behind her. I think they are Idessa (sitting) and Gitla. Who is the good-looking young woman on the left? She appears in other photos and it is a riddle that has yet to be solved. Did Abraham Moshe have three girls? My father visited Poland in 1937. His story appears on another page. He brought with him several photos of Abraham Moshe and his immediate family. See the page about Ariel's visit the family in Poland. Abraham Moshe died on 26 Feb 1938 and was buried in Zawiercie alongside his parents and two other Sznajderman family members: his uncle, Isachar Dov, son of Yizchak Yekutiel Sznajderman, who is the brother of our great grandfather Eliezer, and another grave of Rachel Bajla Sznajderman whose link to the tree I haven’t discovered yet. 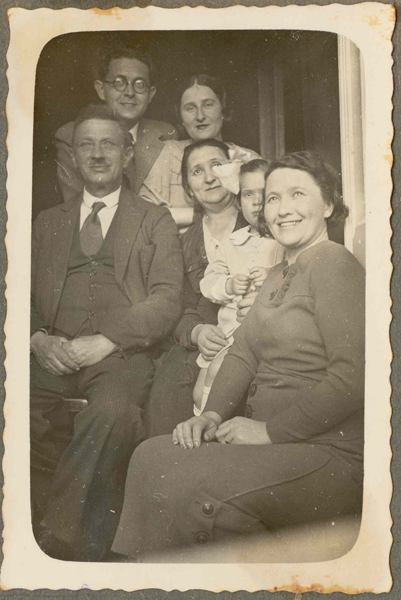 Abraham Moshe, his wife Adela Koenigsberg, grand daughter Irene and ?. Standing: Dawid Sznajderman and his wife, Fela Perlmuter. 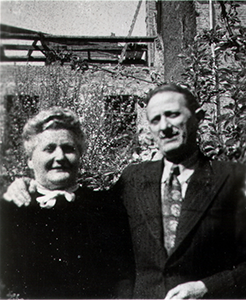 Abraham Sznajderman’s wife was Ajdla Sznajderman. At the beginning of WWII she was a widow. 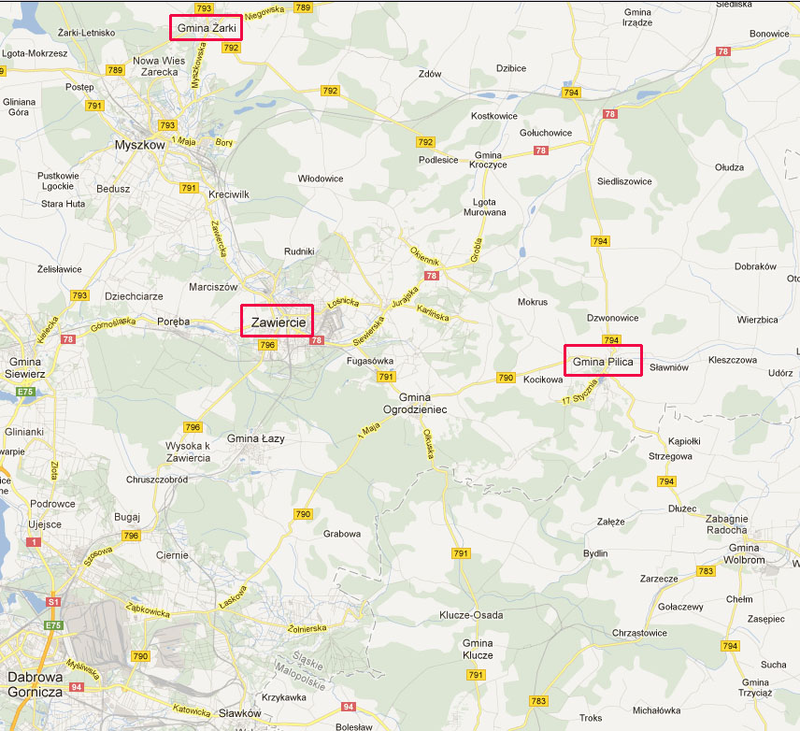 Her children were scattered in Poland, France and Mexico, and I assume that she herself lived in Zawiercie. Her granddaughters Beatrice Bokobza nee Sznajderman and Adela Gorodzinsky nee Perla each filled testimonial pages in Yad Vashem in which they testified that Ajdla was deported to Auschwitz and perished there. In the testimonial page her residence is mentioned as Lodz. Her name doesn’t appear in the Zawiercie Yizkor book’s Necrology. The necrology page of Zarki Yizkor Book gives reference to members of the Koeningsberg family, but I couldn’t link her with them. I didn’t find her name in Lodz Ghetto. On Sep 26, 2012 I sent a request about Ajdla and her daughter, Guta Sznajderman, to the International Tracing Service (ITS) in Bad Arolsen which serves victims of Nazi persecutions and their families by documenting their fates through the archives it manages. I will update the page when and if I get substantial information. It touched my heart that Beatrice Sznajderman, who was born immediately after WWII in France and raised there, and Adela Perla, who grew up in Mexico, both remembered to add a page of testimony for their grandmother. Beatrice’s father, Maurice or Mordka, and Adela’s grandmother, Idessa or Judith, were brother and sister. The granddaughters grew up on different continents of the world. They never met and I think that to this day they don’t know about the each other. Again the wandering Jew. Adela Perla was named after her great grandmother, Adela Sznajderman nee Koenigsberg. I wonder what was it about the mother, Adela, that her children remembered to pass along to their children. They certainly commemorated her by naming their daughters in her honor and fostered the respect both granddaughters showed in adding a testimony page for her while visiting Yad Vashem. Maybe Ajdla’s soft face in the photos conveys a hint of her kindness and love. In one photo she is sitting in front of her sewing machine with her daughter leaning on her. In the other photo she is surrounded by her immediate family, hugging her first granddaughter, Irena Sznajderman. Adela Sznajderman nee Koenigsberg, wife of Abraham Moshe and her daughter Judith. Ajdla Sznajderman had two more granddaughters in Paris, Mordka’s daughters: Jeanine, born in 1930 and Regina, born in 1933. Her daughter Judith lived in Mexico before WWII and had two sons before WWII, Yitzhak born in 1929 and Benito born in 1937. Did she ever meet them? Did Maurice and Judith send letters with photos of their children? One can’t look at the last photos without thinking about the last days of Ajdla, her granddaughter, Irena and Irena’s mother, Fela Sznajderman nee Perlmuter. 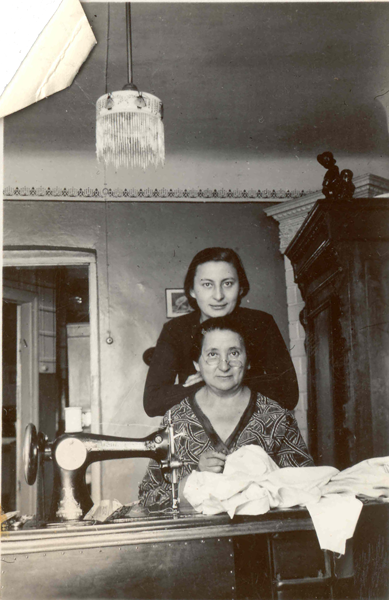 Irena was shot in the street in Bedzin with her mother in 1941. Did Ajdla know about the horrific incident before she herself was deported to Auschwitz? During the Second World War, the town of Pilica was occupied by the German army in September 1939. The Germans created a ghetto where 2,000 Jews were sent. In 1942, all the Jews were transferred to the Wolbrom ghetto and then to the concentration camps. In 1939 there were approximately 7,000 Jews in Zawiercie. On September 2, 1939 about 2,000 of them fled as German troops occupied the city. During the first days of the occupation all Jewish males between the ages of 17 and 50 were ordered to assemble in the market square. They were detained and tortured for nine days before being released. 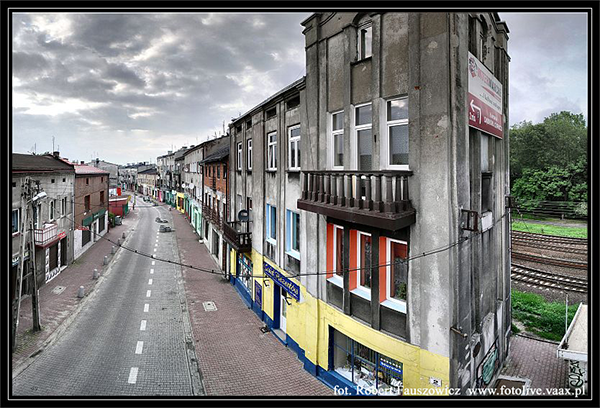 A formal ghetto was established in Zawiercie in the summer of 1940. That fall about 500 young Jews were deported to labor camps in Germany. In a deportation action that took place in May 1942 approximately 2,000 Jews were sent to Auschwitz. The ghetto was finally liquidated on August 26, 1943, when most of the remaining Jews were deported to Auschwitz. During the deportation action 100 Jews were shot on the spot. The 500 remaining Jews were kept at the newly established Zawiercie labor camp, which was subsequently liquidated on October 17, 1943. Genealogy research almost always leads to a sad ending. One reaches the Holocaust years and most of the family members perish. The history for the Sznajderman branch of Eliezer Sznajderman turned out to be brighter. Most of Eliezer’s children left Poland before WWI and began new lives in Israel, France, Germany and the USA. As you see at the opening of the story, the family in Israel grew and continued to stay together. I thank my cousin Tolek Sznajderman who shared my enthusiasm for researching our family roots, but unfortunately passed away suddenly. I thank Daniel Kazez, CRARG, who is always ready to provide records, solve mysteries and read through my stories. I thank Stanley Diamond, JRI-Poland, for the data I have received. I thank all my Sznajderman cousins for sharing with me their stories and enthusiasm. I thank my husband, Amos Wilnai, my sister Ora Kuller and Esther Yu for their comments and editing my story.